The German band with the strangest of names, Orden Ogan, returns with their third long player, To The End. Generally considered heir apparent's to the thrones of Blind Guardian and Running Wild, Orden Ogan delivers another album of melodic heavy power metal. Orden Ogan: The Things We Believe In video. And O2 pretty much has the genre nailed down. While typical of the whole Teutonic power metal sound, To The End is definitely a step up from the previous album Easton Hope. It's not all galloping and rumbling speed, and they've definitely stepped up their vocal arrangements; take not of The Ice Kings or Take This Light, by example. Additionally, there's more variation in the arrangements, though calling any song here progressive power metal may be a stretch. Yet, the title track, Till The Stars Cry Out, Things We Believe In, and epic sounding Angel's War find Orden Ogan expanding the depth of their compositions and musicianship. Conversely, there's some rather generic power metal in Dying Paradise. 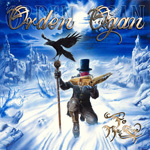 Fundamentally, To The End shows growth and maturity from Orden Ogan in the melodic heavy power metal theater. It's a convincing and entertaining album. Recommended.